NEW VIDEO! This brand new exciting video presentation features Ohr Somayach’s luminaries, Rosh Hayeshiva Rabbi Nota Schiller, Rav of Kehillat Ohr Somayach Rabbi Dr. Yitzchak Breitowitz, Senior Lecturers Rabbi Dr. Dovid Gottlieb and Rabbi Dovid Kaplan. 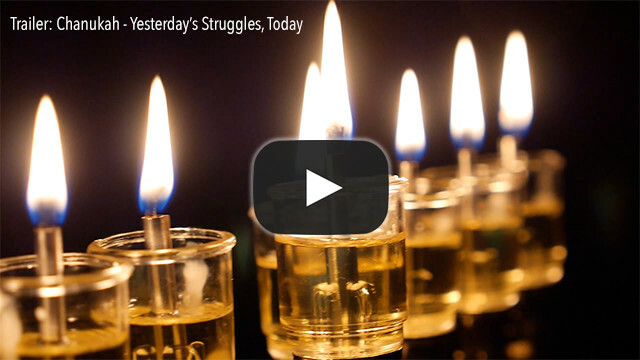 Watch this 42 minute film and enter into the spirit of Chanukah by infusing this Yom Tov with meaning and understanding. If there was only a miracle for seven days, why do we light for eight? The Haftorah of Chanukah Answers "Why 'Maoz Tzur' Mentions All the Exiles," and "Why Chanukah Emphasizes the Miracle of the Oil and Not the Miraculous Victory"
Is the menorah depicted on Titus' Arch the same menorah that was used in the Temple?